TakkStrip was designed as an array of five sensors combined together into a strip. 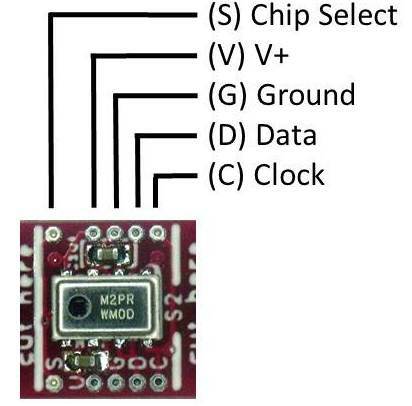 These sensors are modular units which can be separated from the main strip, and then addressed individually through I2C interface, or wired back to the micro-controller of the strip. The image below shows a full strip, and the designated areas for cutting - which are clearly indicated between the sensors. It was found that the best results are achieved when cutting is performed with a Dremel handheld tool. The cutting disks used (N409) in this tutorial are shown below, and they are 0.6mm thick (0.025in). The strip is held in a vice to secure it position during the cutting. The breakouts provided to allow easy soldering of the sensors back to the traffic cop (indicated as "optional wiring" in the diagram above). The hole size is 0.4mm, which is designed to fit 30G solidcore wire.